I’m really enjoying Paul Twivy’s book Be Your Own Politician, which champions social action and citizen engagement, informed by his insider knowledge of how challenging it is to promote and negotiate support for that within the political establishment and Whitehall. Paul recounts how he succeeded through work with Comic Relief, Timebanking, Change the World for a Fiver, and the Big Lunch, among much else – but not so much with the Big Society Network and Your Square Mile. His chapter on how this unwound is fascinating, and generally confirms my understanding as an independent observer and also paid-for socialreporter for the Network at one stage. Here’s the Big Society Wikipedia entry. Paul recounts the point at which the change of leadership of the Network, from his initial role to that of Steve Moore, emerged through Steve promoting the fact in his bio for a TEDx event in Athens in November 2010. I picked up the bio reference – without any briefing from Steve – and blogged a piece “Steve Moore leads new Big Society Innovation Platform“. I aimed to provide people with an even-handed update on Big Society developments, because they were so difficult to come by, and declared I’d known Steve for a some years and worked directly for him and then the Network. I explain that Paul had worked hard on developing Your Square Mile, and this was due to launch soon. Unfortunately Steve had jumped ahead of any official announcement, and Paul recounts in his book the difficulty and embarrassment this caused. (I didn’t appreciate until now that Steve had used Paul’s slides for his talk). May I offer a retrospective apology for my part in the upset? I probably should have checked, since I had worked for the Network, and owed it more than a purely journalistic relationship. On the other hand, there was considerable public interest in Big Society and the Network, and I think it’s fair to say I was one of very few people trying to get behind the politics and provide a running account. I was frustrated by the lack of briefing – although reading Paul’s account, I can now better understand the reason for that. It wasn’t an open process. Anyway, you can read that particular blog post here, and judge its tone yourself. The tag cloud on this blog – right sidebar – shows that that over the years I’ve written more about Big Society, Big Society Network, and Your Square Mile than most topics, starting with a report of the launch. That includes a video interview with Paul and Nat Wei, as well as David Cameron’s remarks. I subsequently joined the Your Square Mile mutual, reported the launch, including an interview with Paul. I’ll leave the retrospection at that for now, although it would be interesting to reflect on what Your Square Mile was trying to achieve, and whether there are lessons for what’s now needed for local social action, blending digital and non-digital methods. There may be some wider value in the work I’ve been doing with Drew Mackie on Living Well in the Digital Age, and the idea of local Living Labs. Here’s some thinking on operating systems and social apps, connecting local frameworks with the DCLG Grey Cells model. Do we need Operating Systems for Living Well in the Digital Age? Last July Baroness Newlove, the Government’s Champion for Active Safer Communities, promoted the idea of a central information hub for community activitists, as I reported here. Her latest report favours Your Square Mile as the the solution. I am a firm believer in the power of information. Technology has, of course, changed everything in terms of the ease and speed at which information can be got out there. I applaud this Government for the importance it attaches to transparency. Putting more data into the hands of citizens means they can hold services and decision makers to account. It means they are also in a better position to get involved, by working out exactly what needs doing to improve their neighbourhood. However, as I have said elsewhere in this report, I get very frustrated, whenever I see information wrapped up in jargon or presented in very complicated formats. Organisations need not just to surrender the information they hold. They also need to remove all the trappings that suit professionals, or other people well versed in bureaucracy, who have the time and training to handle data. These unnecessary barriers will discourage the people who really count: hard-pressed local residents trying to work out what’s going on, what to do and how best to do it. My original report in March 2011, and the Government Progress Update that followed in July, set out the criteria for a successful, effective online ‘hub’ for the kind of grassroots activists I believe in. I have said that I want to see a service that is clear and simple for the end users. The information they need should be just a couple of clicks away. It should be presented in language that everyone can relate to and understand. A good hub would showcase what works and explain how different areas have overcome problems. There would be content provided by activists and practitioners, rather than Government. There would be links to local information, allowing activists to get their hands on facts unique to their area. In July we also said that, if there were promising models already out there, or in the pipeline, time and money should not be wasted on ‘re-inventing the wheel’. In September, when I met up with activists from the seven Newlove Neighbourhoods who so generously helped me in compiling my original report, I sought further advice from them on what they liked in online information and advice. Bearing all of this in mind, one model stands out: yoursquaremile. co.uk. This website was launched in October 2011. It is early days and I really hope it meets its huge potential. It meets the criteria I set out in previous reports, and which I have summarised again above. The Be a Savvy Citizen town map is easy on the eye and easy to use. With a couple of clicks, it allows users to find information on whatever aspect of local life is concerning them and signposts them to where they can go for expert advice if needed. The Local Info facility means that people can find all kinds of information about their neighbourhood gathered together in one place. They can, for instance, find the crime map for their street without needing to log on to police.uk and re-entering their postcode. 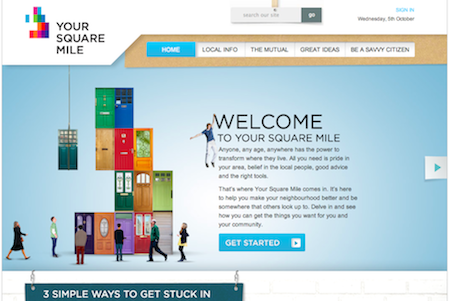 Your Square Mile has great promise to be that online website hub for grassroots community activists. As this technology is so fast moving, I shall also keep a look out for other sites which may develop. There are other websites out there to help grassroots activists grasp the tools and materials they need. Many spring up daily across the web and in other English speaking countries. … it doesn’t refer to the more obviously relevant ones like Our Society, ABCDEurope, and NatCan that are each doing well in attracting hundreds of members and a wide range of discussion and resources. Networks like Transition Towns, Fiery Spirits and i-volunteer show what’s possible with additional facilitation. Nor is there any mention of the Media Trust Newsnet project, supported by the Big Lottery Fund with £1.89 million. More here in my previous posts. 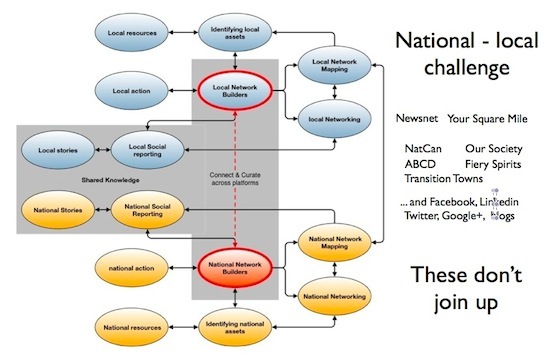 The features of Your Square Mile that Baroness Newlove highlights are valuable, but there isn’t yet anywhere for activists to tell their stories or network with others, and as I wrote in my earlier piece I think the idea of one hub is a mistake. We need a well-connected network of sites. More on that in a later post. Six months development work by the Your Square Mile programme came together yesterday with the launch in London of a new website to support local action, new pledges of cross-party support, and plans to create a citizens mutual organisation with millions of members. You can catch up on the background to Your Square Mile on my earlier post here, including a talk though the site by YSM managing director Jamie Cowen. Today at 1pm Jamie will engage in a live chat online hosted by Our Society here. It looks as if the Your Square Mile initiative, headed by Paul Twivy and supported by the Big Lottery Fund, has found some middle ground between the Tory Big Society and Labour’s Good Society. Tomorrow YSM will be holding a press event to launch it’s new web site http://yoursquaremile.co.uk now online; show a documentary about the pilot projects they have been working with around the country, and explain more about plans to make YSM a mutual owned by millions of citizens. What sort of community media and support for knowledge sharing, learning and innovation do we need – both locally and nationally – when the big society policy agenda expects so much more of citizen-led action? Tags mediatrust, newsnet, ppchange, yoursquaremile | Permalink | Comments Off on How helpful is journalism for People Powered Change? Further thoughts. Opinion surveys and a report from ACEVO – which represents the chief executives of voluntary organisations – have led to a fresh round of stories about how Big Society is doomed, the government must try harder, no-one understands it, and more seriously that BS policies will increase inequality. The Independent on Sunday headlines The Big Society in crisis: Are the wheels coming off the PM’s Big Idea?. The Guardian says Government urged to take a strong lead in Big Society, Third Sector magazine reports Banks missed ‘historic opportunity’ to support voluntary sector and i-volunteer blogs that Forty percent of people still don’t know what the big society means. There’s clearly substance in all the stories, although some are more negative than the tone of the ACEVO report (Word doc) which “embraces the Big Society as an agenda” while calling on the Government to “fill in the blanks” on contributions from banks, support for deprived communities … and also improve communication and leadership. Balancing “real” and online local collaboration: 80/20? A few weeks back I posted a piece over here about the Big Lottery-funded Village SOS programme, which supports some exciting and ambitious local projects, plus local web sites, all linked to a forthcoming BBC series. The big issue it raises for me, in relation to Your Square Mile, is whether there will be training and support for the local online community builders. I should think SocialGo can delive the technology – but it is people who create the content. Is anyone supporting the Village SOS online managers? Balancing "real" and online local collaboration: 80/20?